The Only 5 Easy Exercises You Need to Do Every Day! Getting a little exercise every day is important for your health. Yet while there are various workouts you can do, what follows is perhaps the only exercise you need to do each day. Known as the Five Tibetan Rites, and also referred to as the Fountain of Youth, this practice strengthens and stretches all the main muscles in your body and will help you maintain your balance. Performing these rites daily will therefore keep you limber and strong, no matter how old you are. You can do the practice in just 10 minutes, ideally in the morning, as they will give you a boost of energy. Getting Started: Begin by practicing five to seven repetitions of each rite and build up to 21 reps. 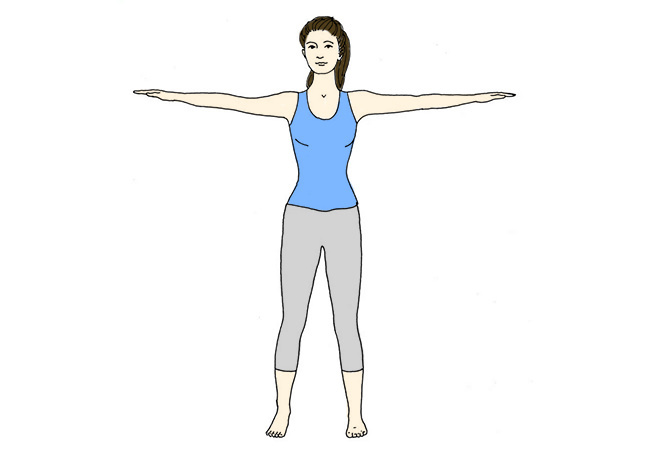 Starting position: Stand with your arms outstretched and horizontal to the floor, keep your palms facing down and your arms in line with your shoulders. Keep your feet hip-width distance apart. Exercise: Stand tall, drawing the crown of your head up toward the ceiling, then focus on a spot in front of you, so that you can count your rotations. Spin around clockwise until you become slightly dizzy. If you're feeling rather dizzy, interlace your fingers at your heart and stare at your thumbs. Be sure to have a chair nearby too, enabling you to hold onto and steady yourself. Start off with two rotations and gradually increase to 21. Starting position: Lie flat on the floor and fully extend your arms by your sides, with the palms of your hands face down on the floor. If you have lower back issues, place your fingers underneath your sacrum. Exercise: Raise your head off the floor as you inhale and tuck your chin into your chest. At the same time lift your legs while keeping your knees straight in a vertical position. Extend your legs over your body toward your head. Slowly exhale and lower your legs and head to the floor, all while keeping your knees straight and your big toes together. Breathing: Breathe in deeply as you lift your head and legs, exhale as you lower them. Starting position: Kneel on the floor, keep your toes curled under. Place your hands on the back of your thigh muscles and tuck your chin toward your chest. Exercise: Slide your hands down the back of your thighs, drawing your shoulders back and your head up toward the sky. Your upper back should be arched more than your lower back. Move your head back as though you were drawing a line with your nose on the ceiling. Return to an upright position slowly and repeat. 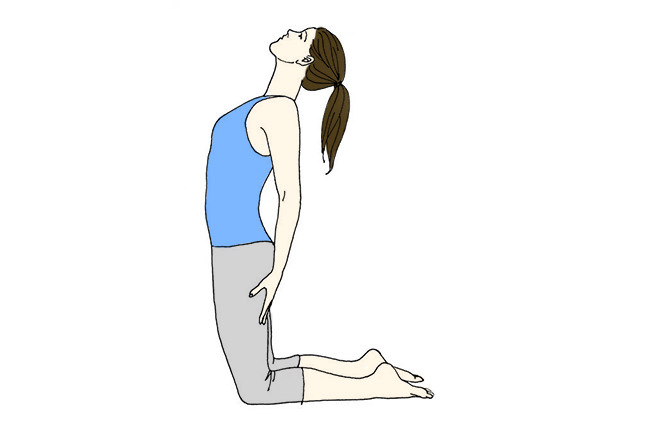 Breathing: Arch your spine as you inhale and as you exhale, return to a standing position. Starting position: sit down on the floor, keep your legs straight out in front of you and keep your feet about 30 centimeters apart. Keep your palms on the floor alongside your sit bones. Exercise: As you gently drop your head back, raise your torso so that your knees bend while your arms remain straight. In this exercise, you are basically in table-top position. Slowly return to your starting position and rest for a few seconds before repeating the exercise. Breathing: As your rise up into the pose, breathe in and hold your breath as you tense your muscles then breathe out fully as you come down. 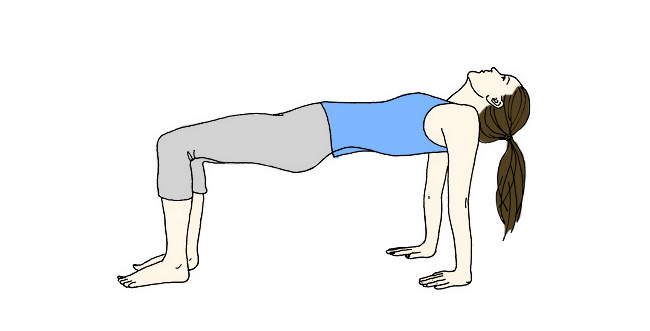 Starting position: Lie down on your belly, keep your palms facing down and in line with your chest. Exercise: Press up into an upward-facing dog by curling your toes under and lifting your heart, drawing your shoulders back. Keep your arms straight and look straight ahead of you. If you are a little more flexible, you can draw your head back and look up and draw your hips up and back, extending your spine into downward-facing dog pose. Repeat, moving back and forth between downward and upward-facing dog. Breathing: As you rise up into upward-facing dog, breathe in, then breathe out as you push back into downward-facing dog.